By now, you've probably heard the back story behind Steve Ells' vision to shake up the traditional quick-service restaurant industry with fresh food inspired by gourmet dishes when he opened the first Chipotle location in 1993. The concept has spawned countless business models for other small restaurants but is now moving into retail strategies from quick-serve restaurants (QSRs) like Taco Bell and Wendy’s. Chipotle spokesman Chris Arnold suggested that little of the company’s success can be credited to marketing. The Denver-based chain only spends 1.75 percent of its revenue on advertising compared to the category average of 5 percent. Marketing spend is split equally between local, traditional and brand-building (like this year’s Farmed and Dangerous Hulu series) programs. "Our approach to marketing in many ways is oriented around storytelling, and we find that traditional advertising isn’t always ideal for us," he said. "Chipotle's brand is rooted very heavily in this bigger picture mission to change the way people think about and eat fast food. Many of the things that make Chipotle different have to do with nuance around our food culture—those don’t necessarily lend all that well to traditional advertising." That same emphasis on fresh ingredients and different types of food have led both Taco Bell and Wendy’s to mix up their approaches, especially in terms of targeting millennials who increasingly favor fast-casual food over typical fast-food grub. The retail idea takes advantage of the foodie craze that’s turned practically everyone into a cuisine connoisseur. For example, Taco Bell has opened a string of concept stores that break out of the chain’s reputation for cheap and quick Mexican food. In August, the brand opened a restaurant called U.S. Taco in Huntington Beach, Calif., to test out a new upscale Mexican food concept. "It’s sort of a sandbox for us to make sure that we get it right before we get into that true expansion phase," explained Jeff Jenkins, co-founder of U.S. Taco. "There’s been a proliferation of the amateur foodie—people [who] are not necessarily foodies by trade, but they come to love food and really want to explore food. Their expectations coming into the restaurant are about experience whereas I think it’s not about necessarily the value and convenience of the QSR category." 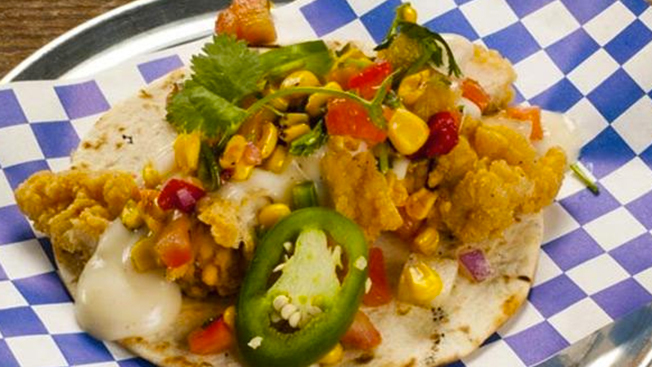 U.S. Taco’s menu consists of 10 American dishes with a Mexican twist—including Maine lobster rolls, Philly Cheese steaks and brisket from Texas—that try to break out of its traditional grub. Food is also prepared with smartphone-toting diners in mind, who have a tendency to take pictures of their meals at higher-end restaurants. Open-face tacos are served on soft tortillas with ingredients piled on top, and plates sit on aluminum platters. "We know that people eat with their eyes in today’s world, but they also actually eat with their cameras," Jenkins said. To set up the restaurant as an experience that is about more than food, glass walls let consumers see how the food is prepared. In lieu of the traditional numbers that are placed on tables, diners set a physical license plate on their tables. Pictures of these license plates are also posted on U.S. Taco’s Instagram account, which has more than 720 followers. In addition to leaning on social media for marketing, U.S. Taco also works with local organizations and events. For example, the restaurant partnered with surfing website Surfline at this year’s Vans U.S. Open of Surfing to cater an event. Taco Bell's parent company Yum Brands is also experimenting with two other concept stores besides U.S. Taco—a Vietnamese sandwich shop called Bahn Shop and Super Chix, a chicken restaurant. As sales continue to dip for standard QSR chains—particularly from younger consumers—one of the biggest appeals of fast-casual restaurants is millennials, said Bonnie Riggs, restaurant analyst at NPD. Per NPD, sales within the restaurant industry are down overall but revenue from fast-casual restaurants is up. Seventy-eight percent of restaurant visits come from QSR chains, meaning that fast-casual restaurants are stealing visits from QSRs. Riggs argued that the food in fast-casual restaurants is more important than the in-store experience for millennials. And, the higher prices at fast-casual restaurants are not steering young adults away, likely because many still rely on their parents for money. "Millennials of today are eating differently than millennials of 10 years ago," Riggs said. "For them, it really is about freshness and quality of product. It’s all about the food."